A computer-generated rendering of the current stage of the Borsuk infantry fighting vehicle (IFV) development has been released by the Polish state-owned OBRUM. The Borsuk will replace the BWP-1, which happens to be the local designation for the Soviet BMP-1. The vehicle is fitted with the ZSSW-30 turret from HSW. This is equipped with a Mk 44 Bushmaster II autocannon from Alliant Techsystems (ATK), a dual-missile launcher (probably designed for Spike-LR, which is already operational with the Polish Army), two banks of four smoke grenade launchers each, an independent commander's sight located on the roof and the GOC-1 Nike gunner's sight from the Polish company PCO on the left of the gun (hidden behind an armored cover when not in use). A co-axial UKM-2000C machine gun is also installed. The Mk 44 Bushmaster II gun is an electrical driven chain gun, usually chambered in 30 x 173 mm. There is however an option to swap barrels for a 40 x 180 mm "Super Forty" supershot round with enhanced penetration (by 30% according to older presentations from the development) and payload. The GOC-1 Nike sight for the gunner incorporates a Polish thermal imager, a set of color cameras and an eyesafe laserrangefinder. The commander is provided with a GOD-1 Iris sight from PCO, incorporating a thermal imager, a daylight camera and a laser rangefinder. The Janus sight is also protected by an armored cover at the sides and rear. The turret has been criticized by Polish defence magazines due to ATK Bushmaster II gun is incompatible with programmable ammunition from other manufacturers (such as Rheinmetall) and the Spike missile integration being still work-in-progress. The vehicle in this configurations will be rather light and is meant to be amphibious. Indicators for this are the rubber band tracks and the water blades. Unlike on most amphibious vehicles, the splash guard seems to be mounted at the lower hull front and probably will be elevated before amphibious operations. The drivetrain includes six roadwheels and two return rollers per side. Like most IFVs the Borsuk will have a front mounted engine. Maybe this is caused by the odd perspective and the lack of track skirts, but the tracks and supsension unit seems to be relatively small compared to the overall height of the hull. This might be affiliated to the amphibious design, but it also might imply a lower suspension performance compared to other vehicles. Based on the fact that it is an amphibious vehicle, the weight and thus the protection level will be limited. The ZSSW-30 turret has a baseline protection in accordance with the STANAG 4569 requirements for level 2 (protection against 7.62 x 39 mm API fired from 30 metres distance). When fitted with additional ceramic composite armor, the turret can meet the level 4 requirements for ballisitc protection (protection against 12.7 mm AP and 14.5 mm API). Given the weight limitations required for an amphibious vehicle, it seems reasonable to assume that a higher protection level than STANAG 4569 level 4 - in best case level 5 protection frontally - cannot be achieved. The current Borsuk design however seems to be a bit lackluster in a number of different aspects. 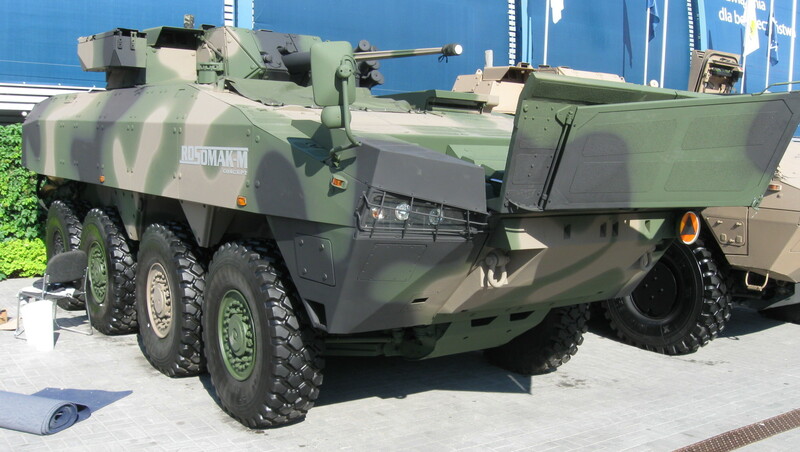 First of all there is the big question of why the Polish Army demands amphibious capabilities for the new IFV, when there are several hundred amphibious Rosomak vehicles with the same armament available. While previously the adoption of ceramic composite armor meant that the amphibious capabilities of the Rosomak where lost (the amphibious baseline version did not offer allround protection against 14.5 mm AP ammunition), recently the Rosomak-M was revealed at MSPO 2015. Thanks to new armor from German company IBD with reduced weight compared to the older armor from Israeli Rafael, the Rosomak-M provides a high level of protection while being amphibious. The current configuration of the Borsuk hull is a lot less than ideal. The driver is only provided with one single sight block, while the commander has two smaller sight blocks. Aside of the gunner's sight in the ZSSW-30 turret, the gunner has no other means of observation. This means that the visibility for the driver, commander and gunner is limited; specifically the driver seems to have an unnecessarily small field of view. While cameras and digitial optronics (like the gunner's and commander's sight) can increase the visibility, the problem withsuch optics is that they are not fail proof (once the power delivery is gone, they won't work) and easier to damage than conventional armor glass/transparent ceramic vision blocks. It has to be noted that the Borsuk is still in the design and conception process, so most things can still change. That the ZSSW-30 turret will be used seems to be guaranteed however. "First of all there is the big question of why the Polish Army demands amphibious capabilities for the new IFV" - because BMP-1 did swim. That's the only answer you will get in simple way that describe why. I can ad couple of more precises but most of them based in the same thing "BMP did swim". That doesn't sound like a very wise decision. So because the Soviets originally made a decision in the 1960s, the Polish Army is doomed to always utilize less-armored/light-weight IFVs? It's not that simple, most of rivers can be crossed wading. Those large enough or deep enough need a river crossing equipment. But even in those places you need to find that "perfect" spot to safety cross the unit. And it is hard, really hard to find one, rivers change all the time and one place that was good couple of years ago now is no go. Without a proper crossing equipment to back you up every one of swim able vehicles is useless. Truck with fuel don't swim. This is not what I'd consider a valid reason for making the Borsuk light enough for amphibious operations. The Rosomak already is amphibious and for a Central European country, the infrastructure should be good enough to support a heavier (and non-amphibious) IFV. Also the Polish Army should have a relatively higher amount of bridge-layers and other support vehicles compared to the old Soviet days. The Bradley IFV and the Marder IFV were designed for amphibious operations originally, but this capability has been dropped over time for reaching a higher protection requirement (in case of the Marder already during late development stages). The Stryker and Boxer are also no amphibious, despite their predecessors (M113 and Fuchs) being demanded to swim. These are pretty gorgeous collection of gold ring design, I am searching for these king of information over last decade and finally find it great post keep it up.